Step right up, tennis fans! 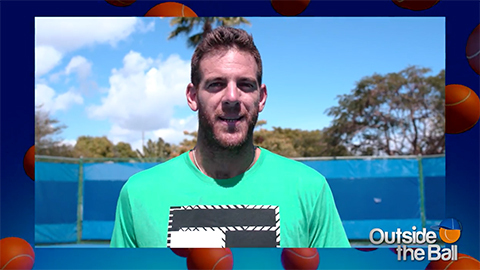 This week we’re putting fans to the test with our Juan Martin del Potro trivia challenge. Del Potro is one of the most loved players on tour, so it shouldn’t be difficult for fans to answer a few questions about the Argentine star, right? Outside the Ball host Mayleen Ramey met with diehard tennis fans around the grounds of the Delray Beach tournament. There she asked questions about Juan from his height, his preferred seat on an airplane, to his favorite superhero. With pondering looks and victorious high fives, fans were prepared to take on the trivia questions and each other. The contestants of our latest fan challenge were competing for a signed racket from del Potro, and fans at home expressed their desire to win a racket of their very own. We heard your pleas, and we are here to deliver. Until June 30th, 2017 you can enter to win a signed Wilson racket from Juan Martin del Potro. Get to know Juan with our Fan Challenge video, then enter to win the giveaway on our website. Juan Martin del Potro Surprises His Fans Juan Martín del Potro and Angelica Get Coaching Tips from Crazy Coach Randy What do Wimbledon semi finalist Dimitrov, Gasquet, Del Potro and Janowicz think of things British? How Well Do Fans Know Grigor Dimitrov? Find Out in the Grigor Dimitrov Fan Challenge! Ana Ivanovic Fans Take the Fan Challenge… Ajde! Wimbledon Champion Garbine Muguruza Fan Challenge-Vamos Garbine!